Solid state hard drives are one of the newest advancements in computer technology. They are already used in many different Apple devices such as iPods and iPhones. There are several different benefits of a solid state hard drive in your Macbook. Solid state hard drives process quicker so your device will work faster, they are safer to have in any type of portable computer, and they are easy to place in the spot of a traditional hard drive because they provide the same function and they are increasingly becoming more cost effective. A definite benefit of a solid state hard drive is that they work faster than the traditional disk drive. They access data quicker and provide an overall healthier functioning computer. While some operating systems are not designed to run with a solid state hard drive, others, such as Mac, are and they are higher performing with the solid state drive. At some point in time, everyone will accidentally set down their laptop a little too roughly. They will also want to carry the Macbook around in a bag or in their hands. Mostly this does not do too much damage to the laptop, but occasionally the traditional, spinning hard disk may be damaged if it is moving at the time. This damage can be avoided by putting a solid state hard drive in your Macbook. The solid state hard drive has no spinning disk, therefore, it can be set down roughly or even placed in a bag while the computer is running or hibernating with little risk to the hard drive. 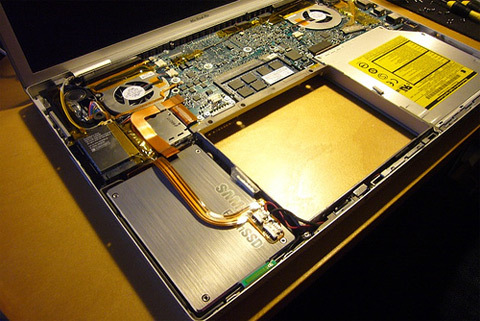 The less parts that are moving in a laptop, the less damage that can be caused by porting the laptop around. This way you will never have to worry about your information becoming lost or damaged because of hard drive damage due to upsetting the spinning disk. The solid state hard drive can easily replace the traditional spinning disk. On the outside these drive looks mostly the same and they fit into the same places. Every year the solid state hard drive becomes cheaper to make and it has more space to store things on. This cheaper costing drive is beginning to become the preferred way of operating a Macbook and other laptop computers. The solid state hard drive is on its way to becoming the standard method of computer information storage. There are many benefits of a solid state hard drive in your Macbook. So when buying your next Apple computer you should consider adding a solid state hard drive to your mac.